Every year, YSS conducts a test for boys and girls from standard 11 of Government Sarvodaya Co-Ed Vidyalaya based on Gurudeva Sri Sri Paramahansa Yoganandaji’s book - The Law of Success. Filled with sensible down-to-earth wisdom, The Law of Success explores the spiritual sources of creativity, positive thinking, and dynamic will, as well as the success-producing power of self-analysis and meditation. It shows how each one of us can naturally attract happiness and harmony. This school, which has a strength of nearly 4000 students, is located in Rohini in north-West Delhi. 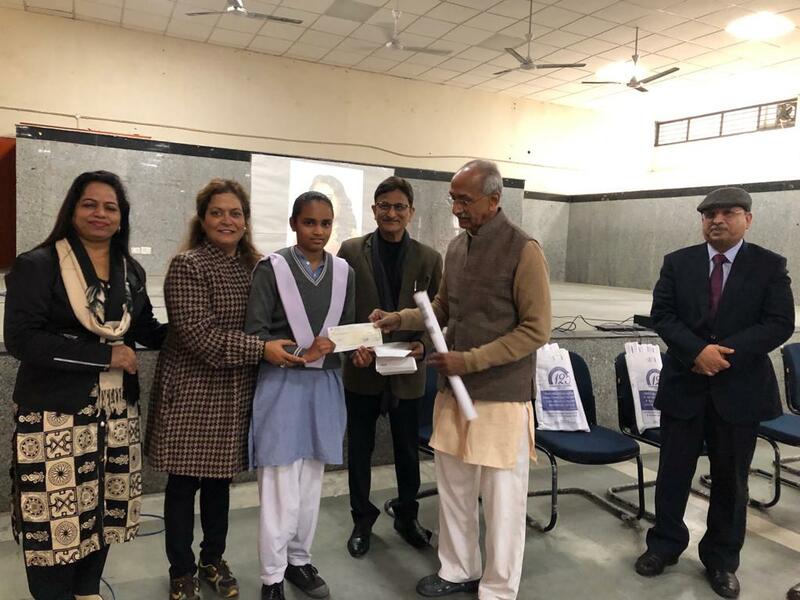 On the basis of the test, five girls and three boys are given the Paramahansa Yogananda Scholarship by YSS Delhi Kendra for two consecutive years. In this way, 16 boys and girls receive the Paramahansa Yogananda Scholarship every year. This year the scholarship distribution ceremony was held at the school on February 16, 2019. The meritorious students had been selected previously through the test conducted by Dr G S Sharma, the Principal of the school. Three members of the Managing Committee of YSS Delhi Kendra visited the school to distribute scholarships, in the presence of around 200 students, the staff and a few guardians. They spoke to the gathering about Gurudeva Sri Sri Paramahansa Yoganandaji, YSS, meditation, and the effect of the book The Law of Success throughout one’s life. Gurudeva's picture was projected on a large board. 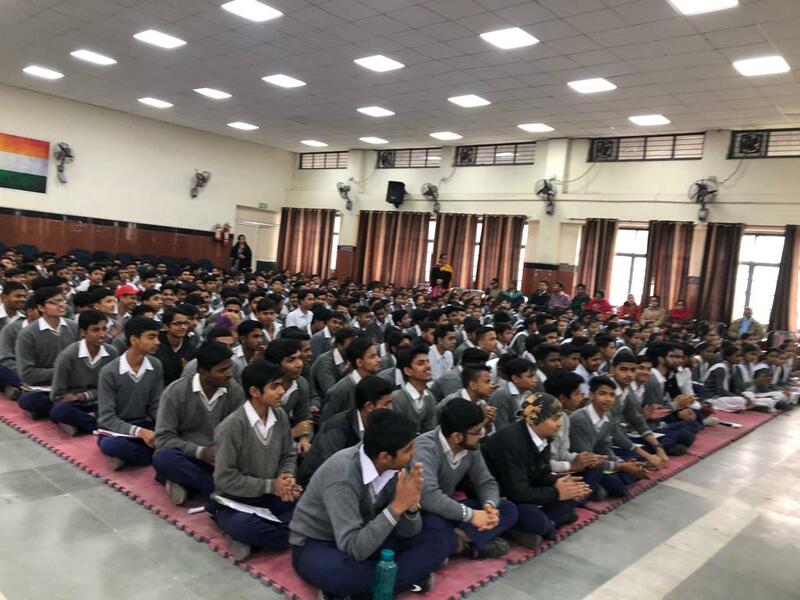 During the p rogramme, the principal guided the students through a brief session of meditation in which the students observed their breath for a few minutes. They were asked how they felt post the meditation period, and many of them responded favourably sharing the calming effect of mediation. A cheque towards scholarship (the amount being INR 4800 for each girl, and INR 4200 for each boy) along with one YSS wall calendar were handed over to each successful student. 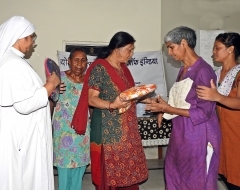 A total amount of INR 73,200 was given to the meritorious students. The school faculty assured that the Paramahansa Yogananda Scholarship scheme will continue in the school. It was a very pleasant and fulfilling experience to see the effect of Guruji’s teachings in the school.